Angel Kings will design, build and launch your startup to the next level. Let’s create America’s next top startup, together. Angel Kings will help build your startup’s website, create your mobile apps, and promote your startup into #1 rankings. Startup Website Design, App Development, Software Creation: Angel Kings’ builds America’s top startups. Are you ready to build America’s next top startup? I'm ready to build the next top startup. Our team of leading front-end and back-end software engineers and developers work 24/7 to ensure your startup wins, too. Startup Website Design and Mobile App Building: AngelKings.com. [Startup Web Design] = Angel Kings’ front-end design and user interface + user experience work to optimize your websites, apps, and software. [Startup Web Development] = Angel Kings’ back-end developers and engineers build the most secure, flawless custom websites, mobile apps, and software in the World. Who are the Angel Kings? Angel Kings is a #1 top-ranked website design and development firm dedicated to helping startups design, build, and launch the next big startup - in any category. For four years in a row, startups rank Angel Kings #1 for website design, mobile development, and engineering. Angel Kings builds the most popular startup websites and applications. Originally founded as a small angel investing fund, we realized that we could have a bigger impact for startups by creating amazing websites and applications (iOS and Android) for startups. Node.js, Angular, React, .NET, Spring, Django, Cordova, TensorFlow, Xamarin, and Microsoft Azure. Amazon E-Commerce, BigCommerce, Magento, Shopify, Shopping Cart solutions, Wordpress, WooCommerce, and custom software integrations. It’s time to build the next big startup, together. Simply request your free quote today. Angel Kings’ startup design and development includes: full-stack developers, back-end, front-end, and mobile developers. We also have a select group of desktop and enterprise applications developers who have created custom SaaS applications, cloud platforms, and software programs. Angel Kings builds the best websites, mobile apps, and software platforms for startups. Learn how we can help your startup too. Digital marketing (SEO, Content, Social Media). The Top 1% of Startup Developers and Software Engineers. Angel Kings specializes in website design, app software development, and software building for startups. Our team is expansive - skill-wise and geographically- and we can help your startup with any design, build, and launch of your products or services. Angel Kings has designed and built some of the most popular startup websites, mobile apps, and software for startups in the World. Click here to get your free quote for web design, development, or software build for your startup. Angel Kings also manages the digital marketing, SEO, and PPC campaigns for startups who want to increase the number of users and customers for their product or websites. We have digital marketing and advertising programs for startups that help drive new user growth and website traffic. Click for a free quote for your startup’s digital marketing efforts. Our Website Design & Development Firm for Startups is stacked with the best talent from around the World. Learn about how Angel Kings only hires the best talent: engineers, software developers, and web designers. Angel Kings has the most selective hiring process of any design and development firm for startups. Angel Kings can help you build websites, mobile applications (both iOS and Android), and also build custom software for startups. We even have digital design team for UI/UX (user interface and user experience) and conversion optimization team for startups that have already launched. Get your FREE quote to learn how we can help your startup build the next big, fastest-growing startup. Get Your Free Design and Development Quote. Note: if you are an established company (Fortune 500 or Fortune 5000), and want to build a new website or application, or improve your SEO, we recommend you check out our partners, Vail Networks, who are experts in web development for business. Vail Networks will design and build websites and custom software for companies with a large budget. Learn about how to design and build America’s top startups with “The Investing King”. Learn more about venture capital and angel investing from the expert on creating America’s next top startups, Ross Blankenship. 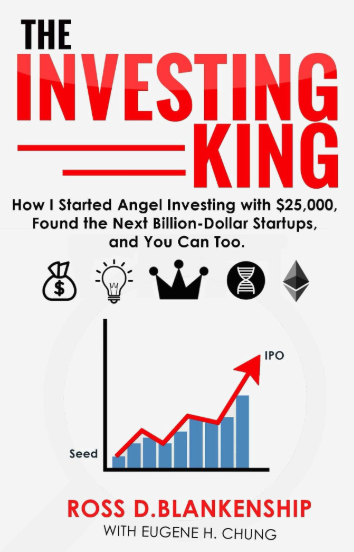 We also released our latest book on startup investing - "The Investing King" - which chronicles the journey of how Angel Kings came into existence, and why we've been successful in finding. Note: you can buy a copy of this book by clicking the image of the book to the right. Another bestselling book we wrote on startups and venture capital was, “Kings Over Aces.” This book provides tips, guidelines and startup rankings for the potential VC investor and angel investors who wants to learn how to get started in venture capital and angel investing. Cyber Nation discusses the importance of the growing cybersecurity industry due to the cyber attacks toward health insurance companies, media companies and even the U.S. government. The book also includes rankings of the hottest cybersecurity startups that have since emerged due to people's increasing need for cyber defense. Angel Kings has build a successful web development and design agency for startups because we have spent more than 20+ years working with startups who want to create websites, mobile applications, and software that transforms the world, for the better. Are you ready to become America’s next top startup, too? Angel Kings: #1 ranked website design and software development team for startups. Custom software design, build, and integration. Digital marketing (SEO and content).